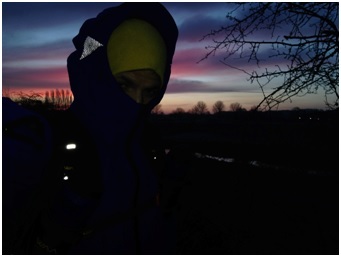 The last 2 months have been rather challenging for Georgios in his preparation for the Marathon des Sables and particularly so under the recent harsh weather conditions here in the UK. The windy, rainy and snowy conditions are the exact opposite of what Georgios will face in the Sahara! However, his spirits are high and despite what comes his way its business as usual for his ultra-marathon preparation. Georgios’ running mileage is piling up and the strength conditioning continues as planned with his trainer and nutritional advisor Craig. His minor training injuries are well managed by his chiropractor specialist Darren and his recovery is successfully aided by his massage therapist Becky Welbourn. No matter what the weather conditions or demanding early morning and night runs, those are not obstacles, simply challenges. Georgios is constantly in pursuit of finding ways to overcome adversity and become more mentally resilient for the expected, and unexpected difficulties that the Sahara has in store for him! Thank you to everyone for your ongoing support and encouraging words for Georgios’ upcoming ultramarathon and our efforts to promote the Opwall Trust’s work for environmental biodiversity conservation.